In the not-so-distant future nearly everyone owns a Meme, a sort of supercharged iPhone that can access information not only across the Internet but inside your brain. It knows to call a cab when you get in the elevator to head home from work. It can order for you at restaurants, anticipating what you will want to eat, bypassing the need for waiters and waitresses and their forced chumminess. And it can provide you with all the entertainment you could ever want, from videos (“streams”) to art (“glyphs”) to books. In fact, so successful are Memes at running their owners’ lives, the need for the printed word is all but gone. Newspapers, magazines, and books have all gone online, the better to be accessed by Meme, and dictionaries have been superseded by The Word Exchange, an online program that instantly pops up definitions on the Meme’s screen when it hears a word spoken in your conversations that you don’t recognize. It’s so quick and easy to look up what you don’t know — phone numbers, song titles, word definitions — that people stop bothering to remember … well, anything. So what happens when a virus spreads a sort of “word flu” inside the Meme operating system that leaves people unable to think straight, speak coherently or use language at all? That’s the premise of The Word Exchange, a book that has a big, exciting premise and lots of small successes but fails to completely pull together into a satisfying whole. The story is told almost entirely from the point of view of Anana, who works with her father, Doug, the editor of the North American Dictionary of the English Language (NADEL). The edition that is about to be printed will be the last printed dictionary on earth and when Doug disappears just prior to the big launch, Anana suspects something sinister might have happened to him. But who could be behind his disappearance? Who wants to suppress the NADEL’s publication? What is going on in the boiler room in the dictionary’s basement? And why are Anana and lots of other people suddenly unable to remember even the simplest vocabulary as she searches for answers? Along with the suspenseful aspects of the plot (“a thriller about the dictionary” is how I described it to my friend Liz), Graedon provides long swatches of conversation and musings by Anana and co-worker Bart on the meaning of language and words. A fair bit of it went over my head, since I was sick the day we covered philosophy in school (ahem), but I got enough of the gist to appreciate what might be at stake in a world where printed words no longer exist. If there’s no authoritative source to prove what a word means (given that online definitions can be altered in the blink of an eye), who gets to write the definitions? And what if the people in charge don’t have the most noble intentions? I wanted to love this book more than I did, although I liked it plenty. It felt as though Graedon expended so much energy and space on both the background of how Memes became so ubiquitous and the philosophy of language that the actual day-to-day plot got shoved to the side at times. The big reveal of the bad guys was a bit anticlimactic. It felt as if The Word Exchange wanted to be two different books — a suspenseful mystery and a love letter to language and the written word — and in the end both suffered a bit for being crammed into the same suitcase. I still think it’s well worth reading, however, for the ways it will make you think about how much you’ve ceded your memory to your computer and smartphone, and how much you love the way language can communicate the human experience in all its glory and despair. Bad grammar drives me crazy. Bad spelling, too. (To say nothing of fragmentary sentences. Ahem.) There’s a reason my AIM handle is grammrdiva (and yes, the misspelling was intentional). I’m not going to lie: I make tiny, (mostly) internal judgments about people who unintentionally misuse language. Yes, I’m one of them. And I do so even though I know I am far from perfect myself. I have a whole host of bad habits that a lifetime’s worth of writing and editing for a living have yet to shake. And I fully expect to be judged by them, too. 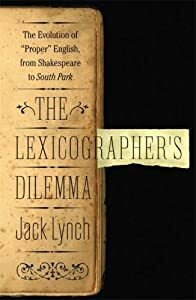 And yet, I sit before you today a (slightly) reformed critic, thanks to The Lexicographer’s Dilemma: The Evolution of ‘Proper’ English, from Shakespeare to South Park by Jack Lynch. Lynch has written an eminently readable review of the ever-changing English language. Maybe it’s my bachelor’s degree in history, but I found his core thesis compelling: English usage and spelling has been shifting constantly since the dawn of the language. The English we now think of as “correct” has gotten that way through popular usage, and not because of any inherent rightness or royal proclamation. Which is not to say that myriad people have not tried to dictate to the masses about how they should speak and write — heavens, how they have tried! Lexicographer’s Dilemma is organized nicely, with chapters examining successive eras in the war against ‘improper’ English. The cumulative effect of reading about all of the smoke-shoveling (as Oliver Wendell Holmes might have termed it) was a metaphorical throwing up of my hands. Maybe Lynch is right, and the only thing that matters is whether we understand the meaning of what someone says or writes, and not whether the speaker/writer used the proper verb conjugation or commonly accepted spelling. In fact, Lynch has a lot to say about the futility of prescriptivists (such being the term for linguists who think matters of language and grammar are a black-and-white affair). It’s clear he is much more at home in the gray area occupied by descriptivists (who are more interested simply in documenting how people are actually using language, regardless of ‘right’ or ‘wrong’). After a few chapters, I found myself agreeing with him, which frankly came as a relief. Single-handedly upholding the standards of good and proper English is exhausting, you know. And as long as I stay away from Internet message boards (LibraryThing’s Talk excepted) and protesters’ signs at political rallies, my blood pressure should be just fine.